Whenever a new number plate change is due, many people are tempted into buying a new car - but is that the right time to buy? Sometimes it's a good idea to hold fire - timing, as they say is everything. So what are the best times to buy a new or used car? Before you rush off on 1 March or 1 September to buy your new car, stop and think about when’s the best time to buy a new car. There are times of the year - and even days of the week - that will save you money. Convertibles are most expensive during the summer months - so shop around in the winter when demand is low and dealers will be quiet. Off-roaders are cheapest when the weather is good. This means it's worth buying one during summer, when there will be plenty of deals around, before prices start to rise coming up to the winter. If you are looking to buy during the year, buy at the end of each quarter. This allows you to put pressure on the dealer as they will be looking to complete sales and are more likely to make a deal. If you want to buy a car later in the year, aim to buy between October and December. Many dealerships discount their cars strongly during these months in order to improve sales figures, and to clear the way for models arriving in the New Year. The weeks around Christmas and the New Year can deliver massive savings. This period is between new plate releases and the dealerships will be quiet, so heavy cuts will be offered in order to maintain sales. Don't be put off by pre-registered cars - there are some great bargains to be had. 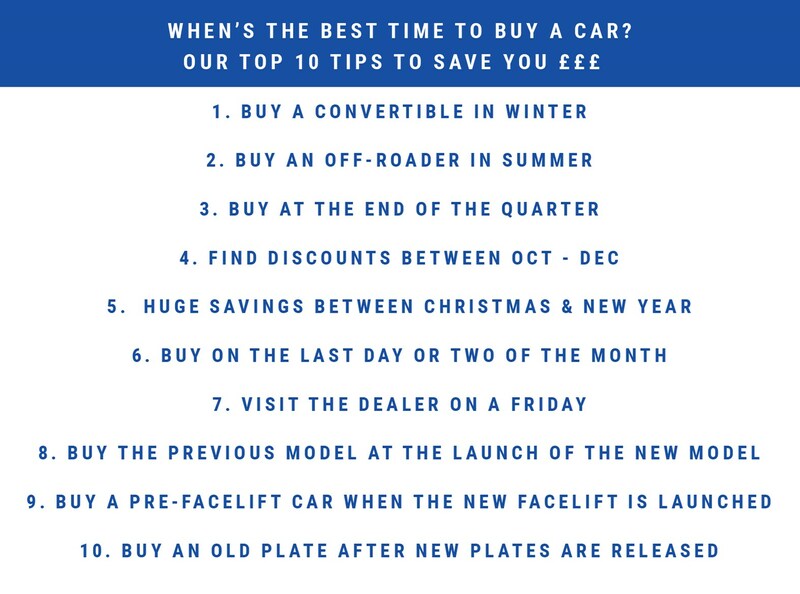 The best time of the month to buy in is the last day or two, as the dealership will do everything they can to complete a sale. Go into the showroom on a Friday. 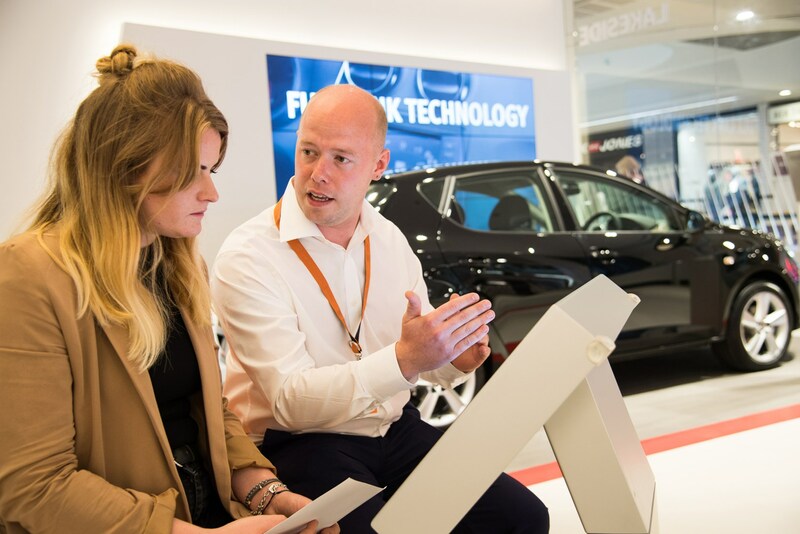 Dealerships are always quietest during the week - this means the staff will be more attentive and more likely to offer discounts in order to meet weekly targets. Buy the previous generation car at the launch of the new one. The older version will drop in price and many dealers will be offering good deals in order to make room for new cars. Buy at the release of facelifted models. Much like the release of a new car, the new facelifted models become the more desirable purchase and consequently dealers look to quickly sell on the pre-facelift cars in order to restock with new ones. Look to buy after the release of new plates. The previous-plate cars will be discounted with the arrival of the new ones, or there may be an excess of new stock, or a run-out model, that allows leverage for a good deal. Lastly, remember to keep an eye on the market. If new or used car sales are struggling then that can give you even more leverage against a dealer, as they'll be working harder to complete sales. Parkers works in partnership with CarFinance 247, to find out more about getting a loan and an idea of what your monthly repayments could be, click here to head to our dedicated section. Looking for a new or used car for sale? You can use the Parkers New Cars for Sale to search your local area for cars, while our Used Cars for Sale section lets you browse used cars for sale in the UK. Our Car Valuation tool will show you what kind of price you should be able to negotiate on all models. Don't forget to get a Car History Check on any used purchase. When's the best time to buy a car? When's the best time to buy a car?